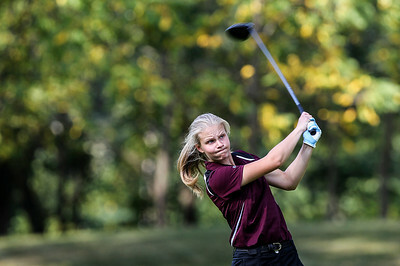 Sarah Nader - snader@shawmedia.com Prairie Ridge's Erin Wing tees off on the 15th hole while competing against Richmond-Burton at Prairie Isle golf course in Crystal Lake Monday, August 26, 2013. Sarah Nader - snader@shawmedia.com Richmond Burtan's Blake Betke chips onto the green while competing against Prairie Ridge at Prairie Isle golf course in Crystal Lake Monday, August 26, 2013. Richmond Burtan's Blake Betke chips onto the green while competing against Prairie Ridge at Prairie Isle golf course in Crystal Lake Monday, August 26, 2013.